I'm sorry for not being around. I have been reading, but haven't gotten it together to comment; and have been struggling too much with fatigue and pain when I try to do doll sewing still. It's so easy to get behind on life, especially when some of the medication designed to help is making me tired/sleepy. I've had to cancel Ohayocon, and at the moment, I'm not really sure I'm still going to Japan for the SD Owners Event (no, I'm not sure what will happen if I can't go, though I have asked). I also bought Jynx a wig, also for no reason. Belated Merhappy Chriskwanzukastice to everyone, and I hope you're enjoying New Year's! Well this was something I wanted to finish before the new year, I've made it in some countries at least. e_e; Though I haven't finished with my non-doll holiday pics yet. >< Thanks to cassiel I got my first pair of Droprops (just in time for Christmas), hopefully I'll get some nice photos of those soon, though Naoya is wearing them in these pics. BTW, I got an honorable mention in the Puki holiday contest! ^^ It was very nice to know people liked my photo enough to vote for it. I won't go into my New Year's resolutions particularly, really I just want to have my health not be such a problem (currently on a two-week heart monitor and still waiting for test results that could be serious), and have more fun (especially with my dolls, of course!). 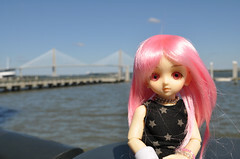 I promised photos; these are from my trip to visit my great aunt in Charleston, SC. Yeah I'm very slow with photos, and now I haven't got Lightroom until I can get my student status sorted . . . blah. The full set is primarily NOT doll photos; but you need photos of fish, Buddha, and cargo ships in your life, too, right? 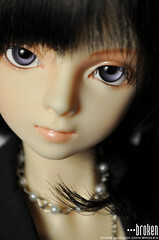 It's pretty easy to spot the doll photos so I won't post them ALL individually here. Sorry about the weird formatting, I can't get Flickr to cooperate. ._. I'm honestly just sort of clinging on to doing anything at all . . . I can't even get it together to take any doll photos. After uhh . . . 82? days (aka just under 3 months), Drift arrived home from his extended stay in Japan last Saturday. Less triumphant return than I'd like, poor boy . . . but this is the first pic posted from the new DSLR (Nikon D90) . . . I have more, but I'm having digital workflow issues. :P Add that to being really sick (apparently I'm positive for strep, wtf? though I still think it may be mono), and I'm very slow and out of it. :| Just like me to go straight from being crazy busy for months to being crazy sick. I have a few more days to decide if I'm crazy enough to go to Japan twice in the same year. Anybody want to come? lol. Meanwhile, I JUST finished processing and putting up photos from my trip to Tenshi-no-Sato, and the Japan photos in general. I also added three pics to the Dolpa stream, just go to my main page. xposting to my personal and doll journals (my battery is dying and I can't find an outlet? 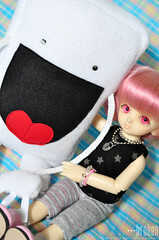 *unplugs lamp* >_>) If you are on my personal journal sorry for high doll randomness. I am currently out of town in Charleston, SC, got in this afternoon and will be here for a week visiting my great aunt and aunt. make like a fry and . . . what do fries do? Sprocket does his impression of a french fry. Random thing I saved from before: these are from a maker of resin wings, so it's about theirs (you don't really need the text anyway so no translation). But it's relevant in general.